Custom-Imprinted Irish Coffee Mugs, Custom Colored Glass Coffee Mugs, and More! Choose from a wide range of Custom Coffee Mugs, including Custom Irish Coffee Mugs, Custom 10 Oz. Glass Coffee Mugs, Custom Blue Coffee Mugs, and many others. Your Custom Glass Coffee Mugs are imprinted at heats up to 1,200 degrees Fahrenheit to ensure that your imprint is durable and long lasting! 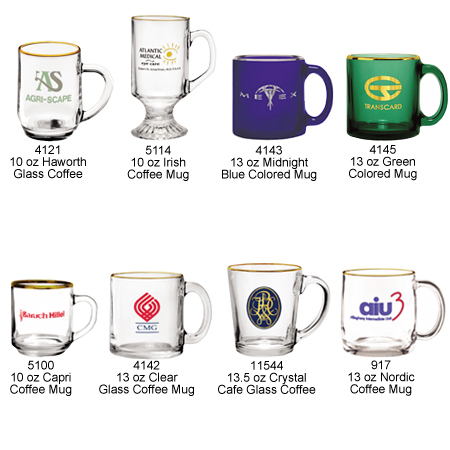 Our Customized Glass Coffee Mugs are great for bars, restaurants, cafes, clubs, fraternities, sororities, and more. The Custom Coffee Mugs also make great promotional give-aways at trade shows and special events. Pricing for Customized Glass Mugs – Call 1-800-233-0828 for more info or to order! 4121 10 oz. Haworth Glass Mug 2.49 2.15 2.06 1.99 1.94 1.81 2-1/4" 2-1/4" 6-13/16"
4143 13 oz. Midnight Blue Colored Mug 3.75 3.36 3.22 2.12 3.02 2.81 2-5/16" 3" 7-15/16"
5100 10 oz. Capri Glass Coffee Mug 2.96 2.59 2.48 2.41 2.33 2.17 2" 2-11/16" 7-5/16"
4142 13 oz. Clear Glass Coffee Mug 3.38 2.99 2.86 2.77 2.69 2.51 2-5/16" 3" 7-15/16"
917 13 oz. Nordic Coffee Mug 3.80 3.39 3.25 3.15 3.05 2.84 2-1/16" 2-3/4" 8-1/4"
It's easy to have your own Glass Promotional Mugs. Simply call 1-800-233-0828, and submit your camera-ready artwork to graphics@kardwell.com (you may also mail your art). The minimum order is just 72 Glass Mugs. You will receive your Mugs in about 3 to 4 weeks. Rush delivery is available.